Ronda is one of the few cities in the world to have a deep gorge running through the heart of the city, and is luckier still to have the Puente Nuevo (new bridge in Spanish) spanning it. The gorge also served as the most formidable defence Ronda’s enemies have ever tried to attack. Known as El Tajo, the gorge was created by constant erosion of the rio Guadalevín which is fed by mountain streams and melting snow high in the mountains of the Sierra de las Nieves. The gorge is quite narrow only 68m at it’s widest, but in places very deep, up to 120 metres, adding to the wonder that makes the gorge and it’s tallest bridge, the Puente Nuevo, one of Spain’s most photographed locations. The rio Guadalevín exits El Tajo into the valley below where it was used by a number of flour mills to drive their grinders but all activity ceased in 1917 after a rock slide destroyed the mills. Most visitors will start their wandering around Ronda on the north side of the gorge, this is the side with the Parador Hotel, the tourist office, the bullring, and where Ronda’s commercial centre is located. The south side is La Ciudad, which forms the heart of Moorish Ronda. One of the more interesting human built sights along the gorge is the water mine, a tunnel carved into the rock and which descends 60m with 231 steps down to the water. It’s an impressive feat of engineering and can be seen by visiting the Moorish King’s House (Casa del Rey Moro) for a tour of the garden and the mine. 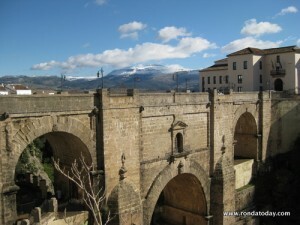 The Puente Nuevo spans the El Tajo gorge at the highest point, and is a must see destination on any tour of Ronda. The north side of the Puente Nuevo is Plaza de España, which is where the Parador hotel, and the Andalucía Tourism Board office is located. The south side is where you’ll find the Santo Domingo convent and across the street from it, the Casa de los Arcos. The road surface is cobbled, and wide enough for traffic to pass in both directions, but watch out for the sharp angle as you exit the bridge into La Ciudad, many a hapless driver has wondered if they hit a tourist when actually they only bounced over the corner of the curb. Pedestrians are able to walk along both sides of the bridge, and there are several seating positions built into the protective barrier, although they are very rarely used for sitting, most tourists see them as a handy step for taking photographs, and why not, after all, the views on a sunny day are spectacular, just be sure not to lean out too far, it is a long drop to the bottom. Photographing the Puente Nuevo can be a challenge although there are several publicly accessible locations that offer good vistas. 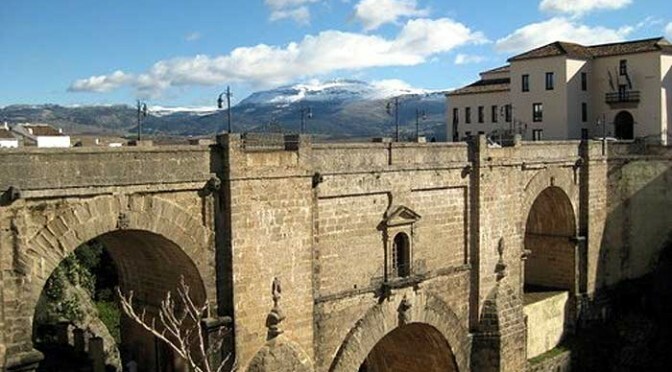 Closest to Plaza de España, walk around the gorge side of the Parador hotel, or from the south side of the bridge, onto the viewing platform next to Santo Domingo. For a wider view of the entire bridge, the Cuenca gardens on the eastern side are a perfect location in the mornings, whilst in the afternoons, the viewing platform in the garden of the House of Don Bosco (1.50€) gives a very pleasing photo. It is also possible to descend into the gorge from Plaza Maria Auxiliadora and take a photo of the bridge at the old gate of Albacara.